Pat Sutton – Passionate About Art And Books. Passionate About Food. Passionate About Life. If you like FUN, art and/or healthy eating then his website is for you. It’s time to bring some fun into your life. Get rid of all those aches and pains by modern eating, modern technology and a whole lot of happiness. This website is an overview of everything I am up to at the moment and how I want to help you to bring something new and exciting to your life. Why not do something fun now. Click Here to get a FREE email Tarot reading. Click Here to like our Facebook page, we’d love you to join us. Click Here to see our “Friends Not Food”, limited edition T Shirts. Click Here to hear more about our diet and to get some great recipes. I produce a lot of my art using an iPad Pro, (you can see one here on Amazon: Apple iPad Pro 10.5″ 64GB Wi-Fi – Space Grey , this is the 10.5 inch one they also do a larger one, (the one I use), which is quite a bit larger, here it is on Amazon, Apple iPad Pro 12.9″ 128GB 4G – Silver – Unlocked ). I also use an Apple Pencil and a fantastic program that you can download onto the iPad called Procreate. Keep an eye out for my “how to” videos. The beauty of using the Ipad is that you can take it with you anywhere, you can take a picture with the camera then upload it into the Procreate program then do your version of it, you could even trace it if you want, that’s good fun too. It’s your life. It’s your rules. Anything goes. I am a self taught artist, a classically trained chef, a Tarot card reader and a food blogger. I am passionate about art, books, The Tarot, cooking and everything food. I eat a cruelty free diet. Since changing my diet I have lost loads of weight and feel wonderful and feel years younger then my age of 67. Now I want to help other people to improve life with art, food and even by having fun with The Tarot to live a longer, more fulfilling life. I have been “Forbes” listed as one of the 30 business women to follow on Twitter. If you would like to follow me, directly below are the links to some of my main social media profiles. Please take a look at my art, I would love to hear your constructive comments. I used to draw and paint a lot in my young days and have found a new passion for it, hence my “One Picture A Day Project” and my passion to show you how to get into art. It doesn’t matter if you are good or not you can still have loads of fun. 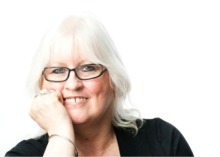 I have been a professional Tarot card reader for many years and have the busy Tarot website, www.thetarot.co.uk which has been established for over 20 years.